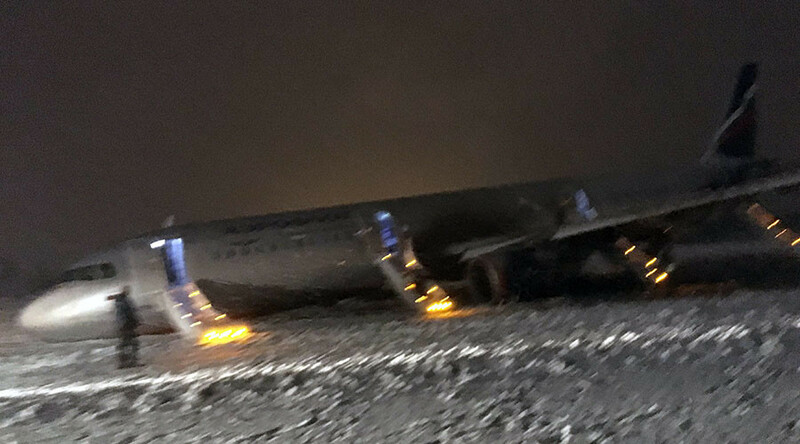 A passenger plane veered off the runway with 171 people on board, just after it landed in the western Russian city of Kaliningrad. One of the plane’s landing gear legs was damaged and the passengers had to be evacuated from the plane via inflatable slides. A video of the plane with the front of the body lying on the ground emerged online. The Aeroflot A321 jet, which was flying from Moscow, had seven crew members and 164 passengers. It stopped 150 meters away from the runway, Ruptly video agency reports. Emergency slides were used to evacuate the passengers. Following the incident, three people required medical help. The local transport prosecution office has launched a probe into the cause of the crash-landing, an official statement on their website stated. There is no equipment to evacuate the A321 plane, and the airport remains closed, a source in the emergency services told TASS news agency. Maria Shatokhina, who was on board the plane, shared with RT her account of what happened, and how she felt.